The Space Jack comes out of a popular card game played on casino floors, Blackjack. Blackjack pays 3 to 1 to the player, even when the dealer has blackjack! Three blackjacks with bets placed on all 3 wins the progressive jackpot! This is a skill-based video game offering many exciting ways of gambling through various playing and betting strategies. A more profitable player option is the choice to DOUBLE DOWN. This can only be done with two card hands, before other cards have been drawn. Doubling down allows you to double your bets (all of them!) and receive one, and only one, additional card to all your hands. 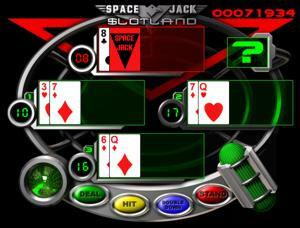 The Space Jack is played with 4 decks which are shuffled after each hand. The Dealer stands on all 17s. An Ace in the Dealer's hand is always counted as 11 if possible without the Dealer going over 21. The rules are simplified in comparison with the original Blackjack game. There is no surrender option, no splitting pairs and no insurance. On the other hand, the Space Jack pays more for a natural 21 then the usual Blackjack pay tables do. The most fundamental difference is that a new card is added to ALL of your hands after drawing (HIT) or doubling down. The object of SpaceJack is to obtain a total of 21 points per hand or as close to 21 points without exceeding 21. Aces count as a 1 or 11, face cards as 10 and all remaining cards are worth of their face value. You are always playing with 3 hands at a time. In the beginning, the Dealer and all your hands are dealt two cards. Then you may draw cards however if you decide to do so, a new card is added to ALL of your hands. If any of them exceeds 21 points, it busts and the wager is lost. If your hand beats the Dealer, it wins. Click the image below to play Space Jack video poker.